The documented history of Washington state (and the United States, for that matter) is fairly recent history compared to the rest of the world; although Native Americans have been living in the area we now call Seattle Southside for thousands of years. Before and after Europeans settled in this area, Des Moines Beach Park was a tremendous source of food and other natural resources for people living nearby. In the nineteenth century, Native Americans set up camps along the beach at low tide to harvest shellfish and salmon. If you’ve ever been to Des Moines Beach Park at low tide and have seen the water spouts up and down the beach from the clams, you know that this area is teeming with potential food! When European settlers arrived, they quickly turned the area into a logging community. 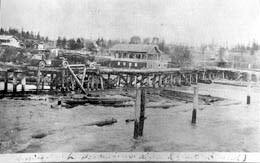 French Canadians were logging the area and in the 1880s, a massive sawmill was operating at Des Moines Creek. In 1889, William Van Gasken purchased the mill and James Markwell built another mill (adjacent to the first). The town of Des Moines even had their own baseball team and the “Sawmillers” won the local championship in 1898. By 1918, the logging era was coming to an end and Mel Neal and Guy Thompson built a dance hall at Des Moines Beach, which became a very popular destination for the Pacific Northwesterners. It was during this period that Des Moines Beach Park as we know it today began to take shape. The only major waterfront recreation sites near Des Moines at the time were Redondo Beach and Alki, so this beautiful beachfront site was a welcome addition. In 1931, the dance hall and park were purchased by the North Pacific Conference of the Evangelical Covenant Church of America. It was under the church’s ownership that the park experienced a boom of growth with plenty of other buildings sprouting up in the area. Years later, in 2006, the Covenant Beach Historical District was listed on the national Register of Historic Places. For more information, please visit http://www.desmoinesartscommission.com/heritage-trail.html.